In the last 52 days of Operation Allied Force, we have spent a lot of time telling and showing you what we, NATO, are doing. 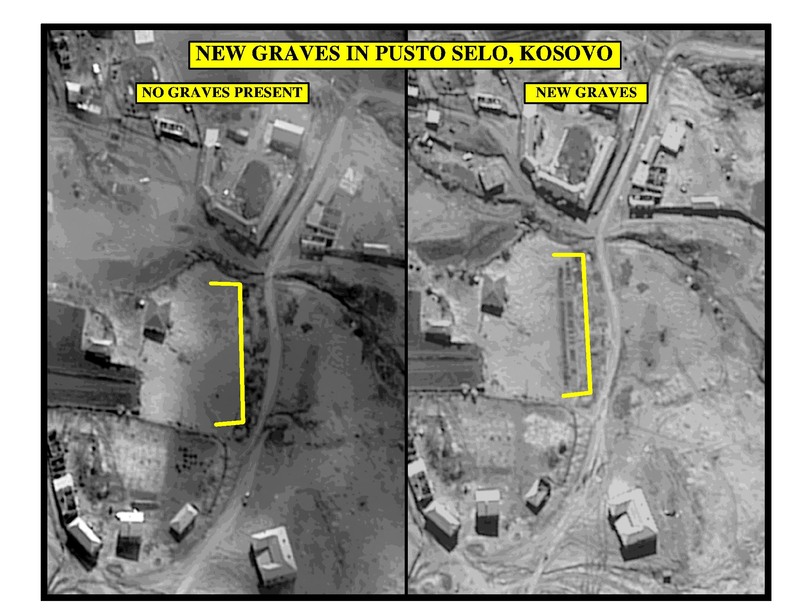 President Milosevic is just as keen to ensure that you do not see what he is doing inside Kosovo. 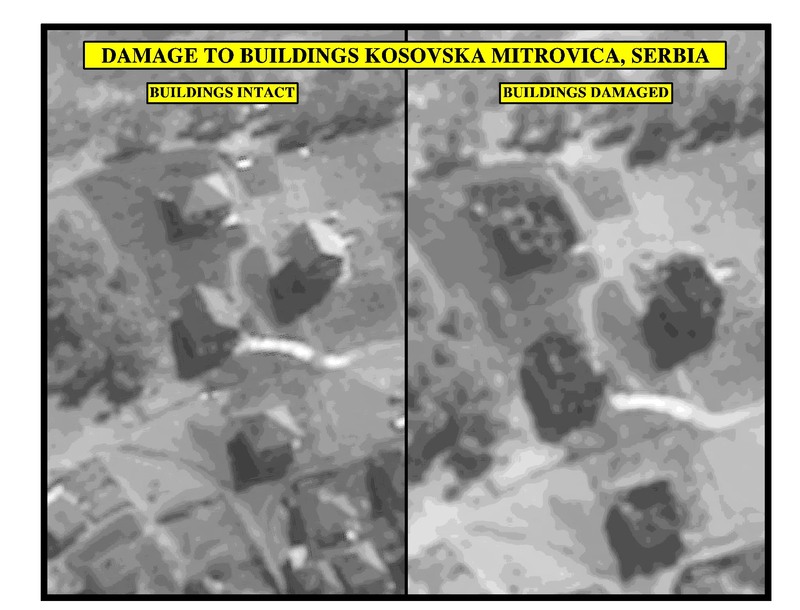 Today, I would like to show you a selection of photographs -- some old, but many new -- which I will call Milosevic's battle damage assessment. First of all, I would like to go to the village of Racaj (1). 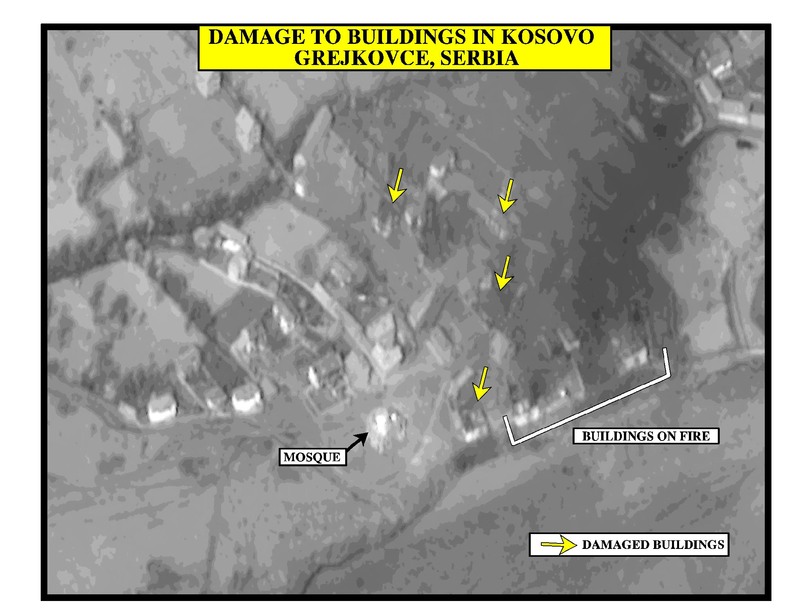 There you see buildings in flames -- that is what happens when the Serb forces come to town, almost complete destruction of most of the houses. Note that there is no blast damage. There you see the village of Bela Crkva (2). 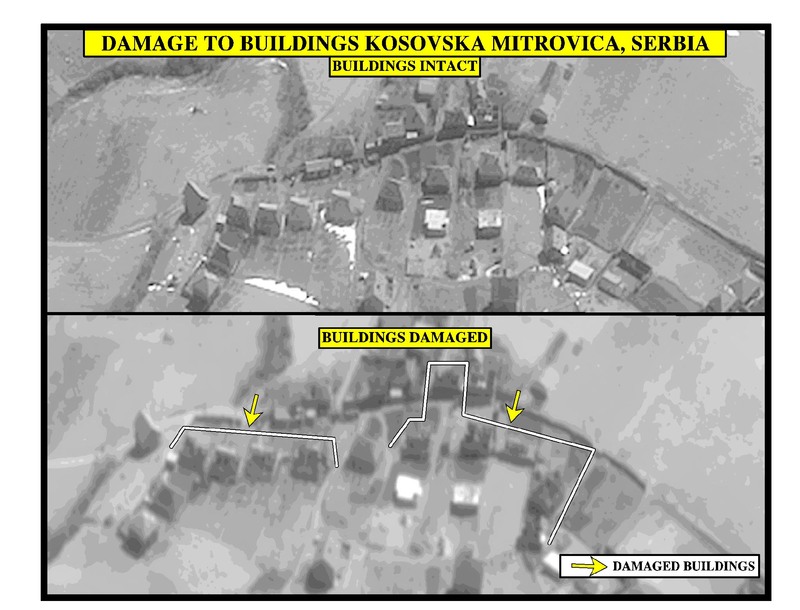 On the left, the buildings are intact, and there, on the right, buildings are damaged. Again, no blast damage: these houses have clearly been set on fire. This is arson, not bombing. Now to Podujevo (3). First, all buildings are intact -- nice smart suburban style villas there. Now look what has happened to them as a (4)result of arson attacks (4). 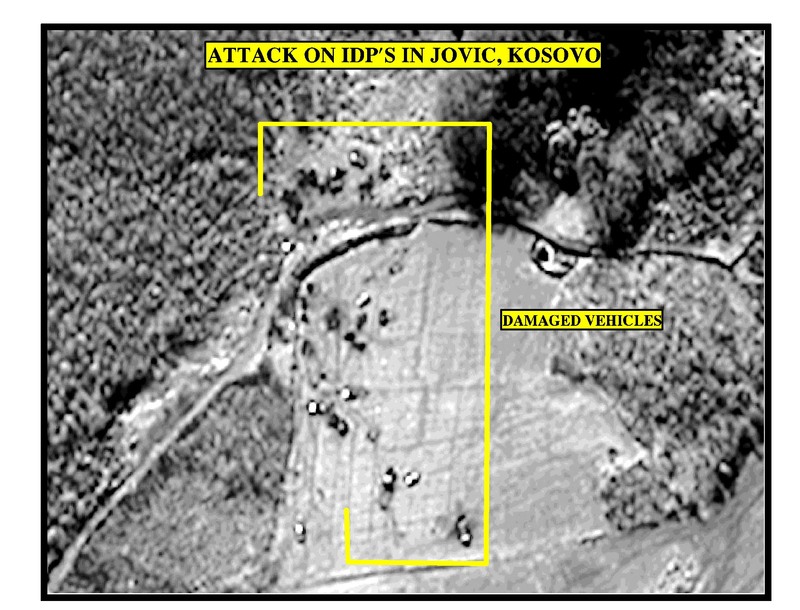 Again, are these military targets? They are not. They are ordinary people's homes where families used to live peacefully, but not any more. 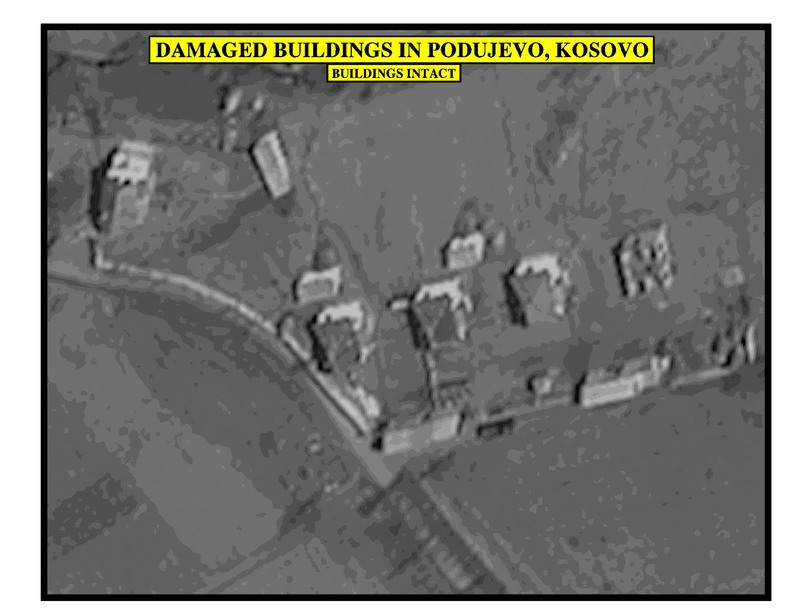 We are still in Podujevo (5), once more with a photograph of the situation before Serb forces came visiting, and then the situation afterwards (6). Again, think of all the people who once lived in those buildings. Where are they now? 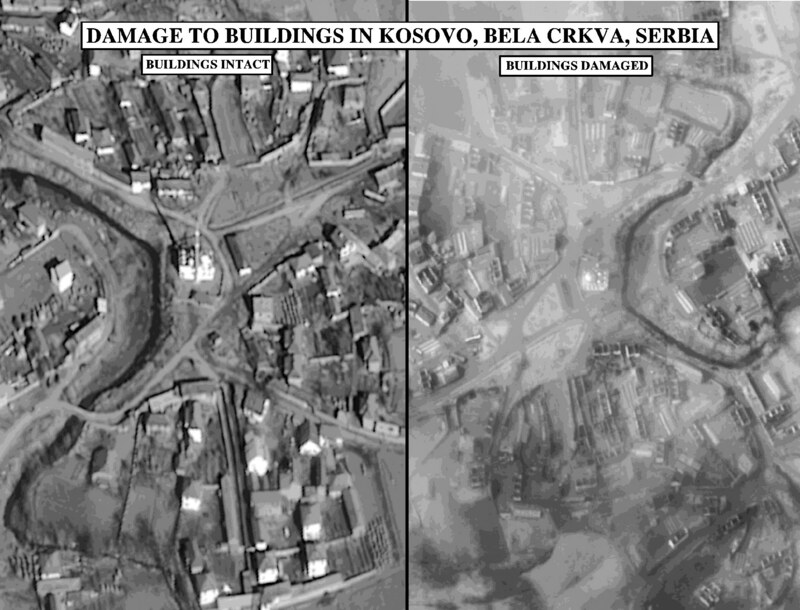 Here we have, top and bottom, in Kosovoska Mitrovica (7) the buildings intact and then the buildings obliterated. It is very systematic. It is very methodical. It is house by house and street by street. Let's go to the next (8). Again, in the same place, again a clear difference. Even from the air you cannot make any mistake about the before and after. More wanton destruction. This is at Grejkovce in Serbia (9). At the bottom is a destroyed mosque. 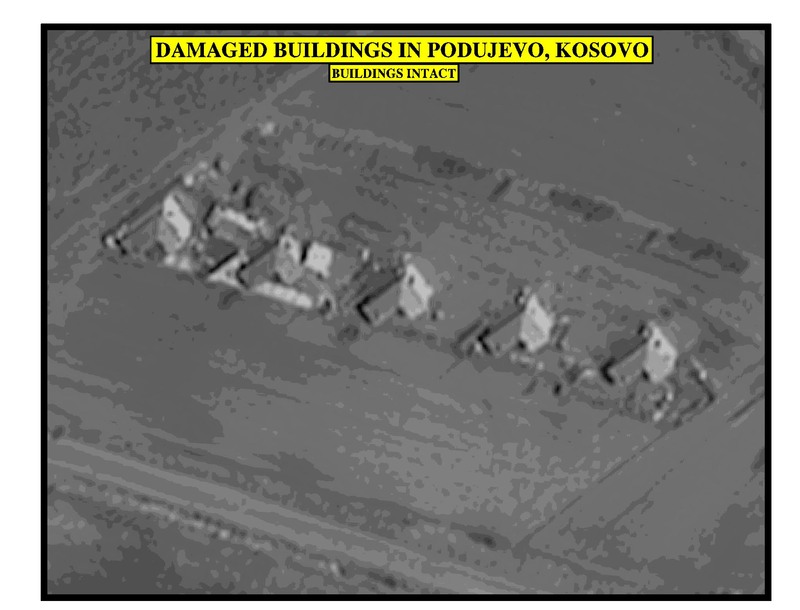 Now the Serbs have spent a lot of time of late telling us about the threat to their cultural heritage in Kosovo, though NATO does not attack Orthodox churches. But you see there clearly a mosque which has been destroyed, burnt. 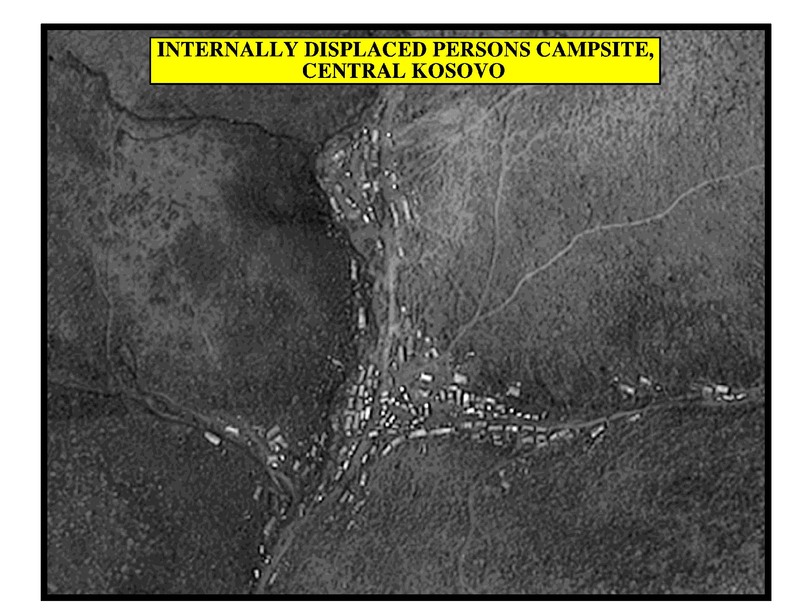 This is a photograph from the air of a campsite of internally displaced persons (10) inside Kosovo. We know that thousands are currently in the valleys, on the hills, in the woods, having been forced from their homes. They are afraid to travel and they are rightfully afraid. All of the refugees that have escaped are telling the same story: roads full of Serb forces, people on railway stations not allowed to board trains or allowed to board only to be turned back later, men pulled from the convoys, some literally at the border post just before they are able to cross to freedom, and verges everywhere littered with dead bodies. 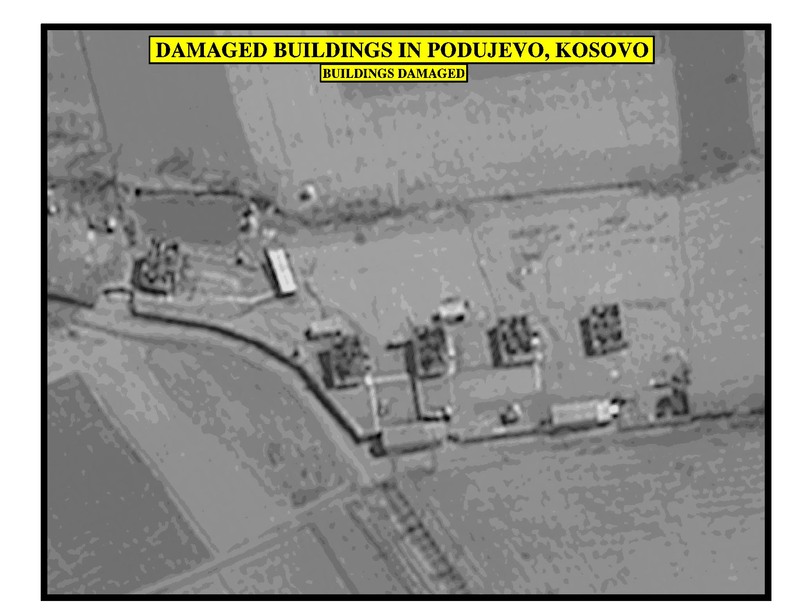 And many of these convoys of internally displaced persons have been attacked, either directly or by shelling, by Serb forces. This is Jovic (11) where we have pictures of many vehicles, cars, of internally displaced persons spread out across a field. As they tried presumably to escape from their attackers, they have either been shelled or they have been deliberately shot at and destroyed, having been set on fire. Again, are these what you might call military targets? Now let's go through to some mass graves. You have seen these before, first at Izbica (12) and there at Pustoselo (13). 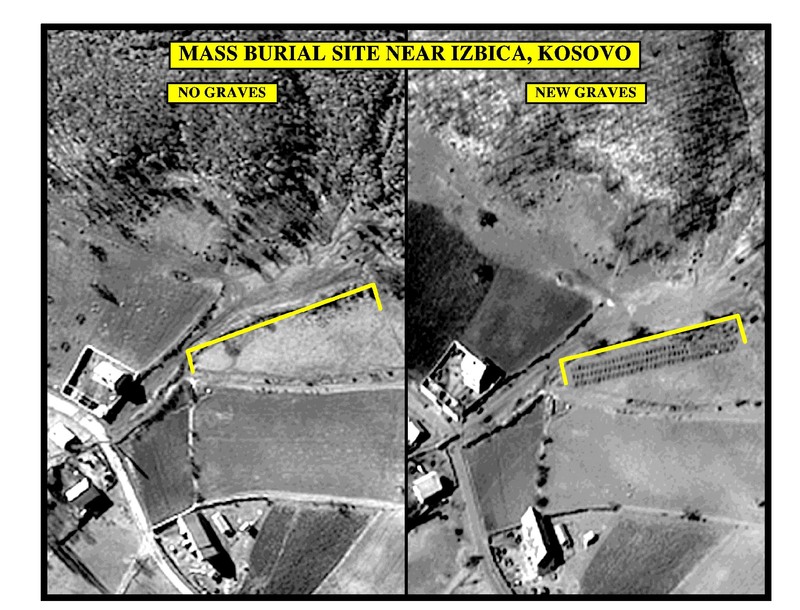 But we have, from refugees accounts, of up to 43 mass graves currently in Kosovo and God knows, quite frankly, what we are going to find once Kosovo is open again and the International War Crimes Tribunal is able to check out these stories and excavate the sites. 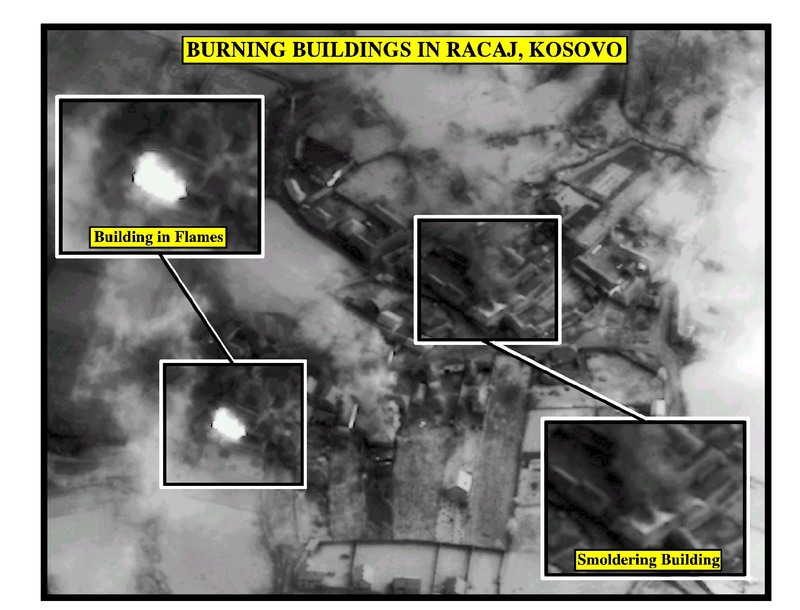 There is certainly no military rationale behind the type of incidents that these pictures show. Now let me add some colour to these pictures and the best testimony comes from the refugees themselves. The first place that I showed you at Rakaj, witnesses have told of Serb forces attacking on 3 April. The town was looted and burnt. Women and children hid in a nearby ravine. The police told them that they "could not leave until the police had burnt all the houses.". Three men who tried to flee were shot, another 8 bodies were found in the town centre. Or in Kosovska Metrovica, this used to be a town of 58,000, from which all of the Kosovar Albanians were expelled in mid-April. A 43 year old man gave the following account to Medicin Sans Frontier: "Around 20 masked paramilitaries came into our home on the afternoon of 14 April. They told us to leave immediately. They emptied out the town, district by district. On the way, we picked up a woman who was walking alone with her baby. She told us that her husband had been taken away by the Serbs that morning. On the road there were many policemen and masked soldiers. They stole 1,000 deutschmarks from us. They took some of the men away. I told them I had a heart condition and they let me go." Let's look again at Belakuvka where on the morning of 25 March the Serbs struck, leaving the village burnt and more than 60 men dead. A survivor told the French newspaper Le Monde that the men, and some of them as young as 12, were marched to a stream. "It was then that they opened fire. I was thrown into the water and others fell on top of me, and then nothing. Five minutes later I heard another gust of machine gun fire firing away. After about 20 minutes I moved. There were 6 survivors, but 4 were wounded. I didn't have anything. I think there were between 35 and 40 dead, of which 4 were my cousins." Remember when we see these pictures and hear these stories, these are just ordinary decent people - farmers, doctors, teachers, mechanics - whose lives were destroyed for one reason and one reason only: their ethnicity. 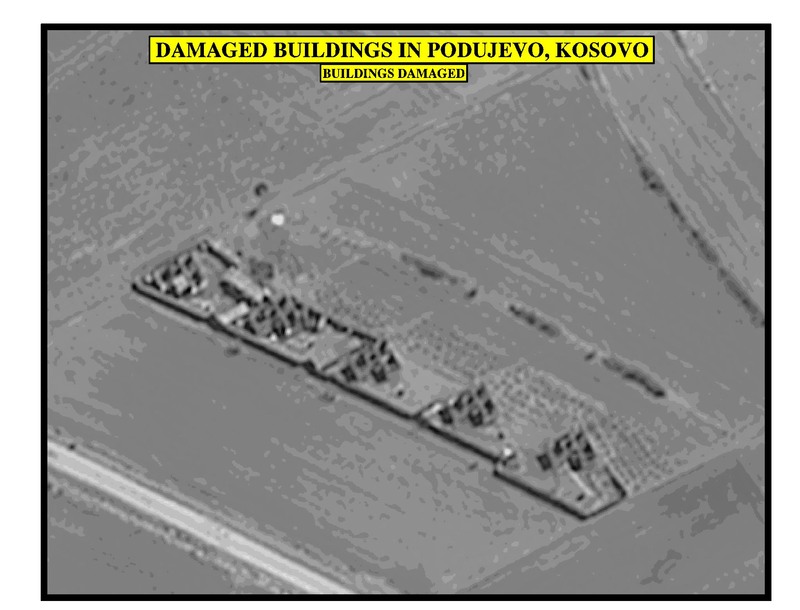 These eye-witness accounts and the photographs that you have seen provide an increasingly clear picture of what is happening inside Kosovo, the reality and not the propaganda of Belgrade. And it is these facts that have really stiffened the spine of the Alliance to halt and reverse the ethnic cleansing. NATO will prevail in creating the conditions for peace and then we will help those people go back to their homes and start again.